So it’s been almost a year since we felt that horrible gut punch of a feeling that something was wrong again and in that time what Nathan and my family has endured has been continuous… BUT here we are at 196 days POST transplant almost our 200 day mark (10/21/2017) and there really hasn’t been a change in Nathan to be honest with you, the Dr’s pulled his lines out at the beginning of August to give him quality of life to thrive as much as he can without the line risks tagging along. Nathan was at his end wits just drowning in his own world not being able to do anything at all and with sled Hockey season nearing the Dr knew what her patient needed and that was to get back on that ice and thrive. Sled hockey has given so much back to Nathan and it’s a way out, a release for him in his world of “NOTHING” He was thrilled to be going back but of course that comes with a lot of precautions and labs, and if needed transfusions, all of which Nathan has to be stuck for, besides all his normal sticks, labs, infusions, and whatever else comes down the road. We take one day at a time and enjoy everything we can as we honestly don’t know what the next day or week may bring to our family. Nathan has been having a lot of difficulties with weight (he’s lost a lot because his lack of stomach function ), GVHD, neuropathy, walking and with a “drop foot” situation, so of course you all know what that means…back to MORE APPOINTMENTS AND DRs, everyone’s favorite topic….NOT!!!! Where we are now?? Nathan is waiting on a new foot brace to help him walk without the drop foot happening, which is very necessary because as that happen to be on his limb salvage leg, he cannot flex at the knee making it extremely hard for him to follow through with a step causing him to be a very high fall risk, and we’ve been there before and that was no fun. We also have neurology set up to see what they think, as the orthopedic feels there’s multiple things happening, not just one that it appears and the two are of separate entities…the neuropathy being caused by treatments and no explanation for the drop foot yet. Nathan’s labs continue to be the same for the most part as they’ve been for some time, his outter labs (CBCs) continue to hang in there jumping up and down, but that’s can be a normal thing depending on his day, his inner labs (Ts and Bs) from the transplant don’t seem to be budging any and he needs those to grow to start developing an immune system again, as well as redoing ALL his immunizations since the transplant wiped them all out, so we very cautiously move forward with life all while still being on his transplant meds. Nathan was permitted to attend his classes, as they are homeschooling classes with minimal kids in the class; his school and peers have been fantastic and very supportive with considering his circumstances, they have above and beyond to accommodate, but the flu season is arriving and I cannot deny getting very nervous about this while situation, having to pull Nathan back will be very upsetting to him; Nathan has not attended a whole year of school since 3rd grade in school, the year before his original diagnosis, so as a kiddo that loves school, being all home bound and home schooled(home completely) you can imagine what it means to him to be allowed back in classes. 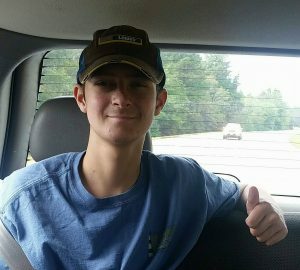 That’s the quick update for Nathan where things are to sum it up…in limbo…he’s exhausted both mentally and physically but continues to push back at cancer with a lot of determination, he refuses to let it beat him, and Thank the Lord for that! We thank you all for continued prayers and positive thoughts as we push steadily through this battle.